I love hash browns with my breakfast. Potatoes go so well with eggs, toast, and bacon; it’s a perfect combination. 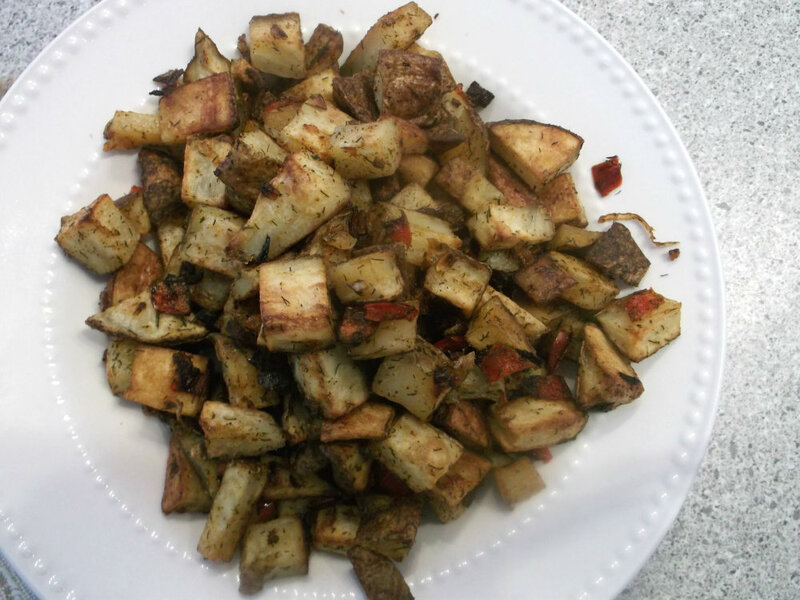 Normally my hash browns consist of potatoes, salt, and maybe a little pepper, but you know sometimes it is good to change your old favorites and try something new. That is where these breakfast potatoes come in. Our son Jon and his fiancée Brianna were with us this past weekend. I wanted to make a nice brunch for them before they left on Sunday. I wanted some hash browns, but not the ones that I normally make. When I found this recipe it looked like it was easy to make and it was baked in the oven, so it free up my time to make the eggs and the bacon. The recipe called for dill or parsley for one of the herbs. Now I know it is just me, but I am a little afraid of dill. Yes, I know that it is silly, but you see I have not done much cooking with dill besides making pickles. And when I was growing up my mother would have never thought of using dill in anything but pickles. So it is silly, but I am always worried that the food may taste a little on the pickle side (if that makes sense). But being the brave soul that I am I chose the dill over the parsley and it was the right choice. We loved these potatoes! Wash potatoes and dice into small cubes. Chop the onion and red pepper, place in a medium bowl along with the potatoes. Add the olive oil and toss to coat all the potatoes. Add the rest of the ingredients and toss to miss, making sure that all the potatoes are well coated. 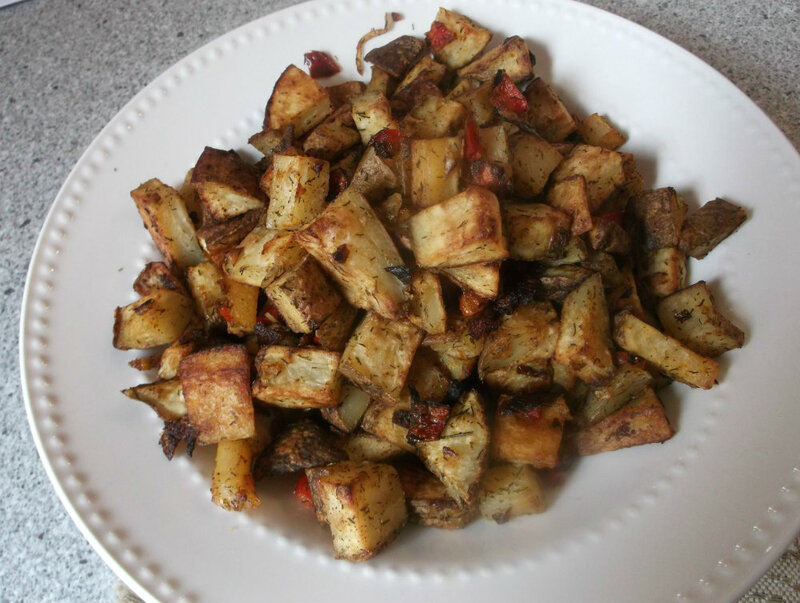 Place potatoes on a aluminum foil lined jelly roll pan that has be sprayed with non sticking cooking spray. Bake for 30 to 40 minutes or until nicely golden brown. I love breakfast potatoes. I could eat the whole bowl full & be totally content. They look delicious. You have to try dill with salmon sometime – a wonderful combo. And these potatoes look wonderful! 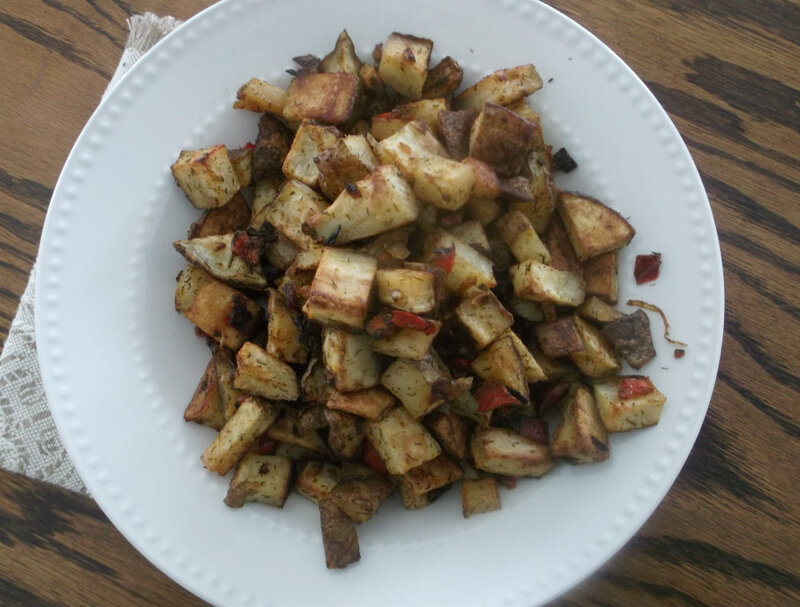 I love potatoes for breakfast, and it’s a treat I don’t have often enough. Good stuff – thanks.